Equiery interns Sara Gordon and Leanna Bostrom have never known a time when there has not been an internet, a worldwide web, or even social media. Nevertheless, they were excited about spending their summer working for a traditional equine media company, taking a press tour, and learning how The Equiery creates its traditional product – and sharing their knowledge with you! Most readers are familiar with The Equiery’s signature monthly printed magazine, but The Equiery is much more than “just” a monthly print publication. 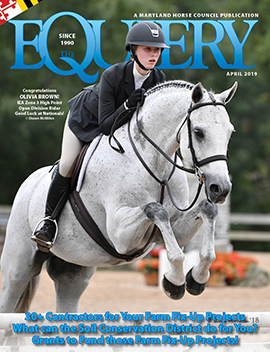 The Equiery is full-service multimedia communication platform for the Maryland equestrian community, complete with a printed magazine, a digital monthly magazine, a website with a searchable database of classifieds and advertisers, and several social media outlets to bring you the latest happenings throughout the state. How does it happen? How is The Equiery created every month? It starts with an old-fashioned premise: “getting to press on time.” The “press” in this case is Frederick News Post Printing and Publishing; each month FNP turns The Equiery’s digital files into the ink-on-paper magazine in your hands. In operation since 1880, FNP currently prints over 40 publications statewide. But before the magazine can be printed, it has to be created, and that happens at The Equiery’s office in Lisbon. The process starts with a key deadline: what day does the new issue need to be in the stores? Schedules are worked backwards chronologically from there with the next date the one on which the issue needs to be actually physically printed. Once the schedule is determined by the publisher (Crystal Brumme Kimball) and the production manager (Katherine O. Rizzo), then the creative process kicks in. Equiery staff members join forces to plan each issue, brainstorming months in advance to ensure coverage of all major events, legislation, and news. The magazine staff is comprised of eight staff members, along with a few interns and freelance photographers, each responsible for crucial jobs in building the print and digital magazine. Crystal Kimball, as publisher, in addition to scheduling and general business infrastructure, oversees the creation and completion of the magazine, which involves contracting for a variety of services and products, including but not limited to print, web services and design, online ad order and ad processing systems, mobile-friendly product development, and more. As editor-in-chief, she oversees editorial policies and also the news related to legislation and regulation. Katherine O. Rizzo is not only the production manager but also the managing editor and art director. She oversees the crafting of the editorial content of each issue, as well as choosing photographs, creating layouts, and approving freelance articles and photography. Associate publisher Jennifer Webster and advertising manager Tracy McKenna oversee client development and management and advertising sales. Emily Nessel, as customer service manager, handles classified ads and manages The Equiery’s digital products (such as eblasts). Once the orders for ads are placed, Cass and Peggy Ingles handle the advertising design. Carolyn Del Grosso assists with customer service and is the controller for the company, handling accounts receivable and payable and managing employee benefits. The duties of interns vary from office work to article writing to covering and photographing events. A pre-production meeting is held between finishing one month’s issue and starting the next, deciding deadlines for such things as article completion, page creation, and ad design. The process follows a general schedule, which starts with choosing which features will go in that issue, which articles will be included, and the selection of a limited number of photos for publication, before sending the features to layout. While editorial is being worked on by Katherine and various contributors, Jennifer, Tracy and Emily are meeting with clients, creating marketing plans, ordering ads and overseeing the design and content of client ads. Cass and Peggy will execute their ad designs. Once all ads and editorial are booked, the pagination process takes place. The staff decides what will be placed on which pages based on requests from clients as well as a set flow of the magazine. For example, the table of contents will always appear on page three and featured editorial will come before regular columns such as Out & About. Upon completion of the pagination notes, our sister company, The California Horsetrader, actually builds the book out of all the ads and editorial provided by The Equiery. Each section of the magazine is processed through a software system that places each ad and piece of finished editorial onto each page as blocks; each block is colored and coded to coordinate with individual ads and editorial. The staff then receives a preview of the magazine which literally looks like colored building blocks on a page. The staff reviews these thumbnails of color blocks to make sure that all ads are in the book, that competing advertisers are not next to each other, and that there is a good balance of editorial vs. advertising content. Once the staff approves these thumbnail pages of colored blocks, The California Horsetrader “flows” the book: a computer software program pulls in the actual ad or editorial based on the previously coded color blocks. And voila, the book is built. This flowed version, with each ad and editorial in place, is then printed in the office and put into a three-ring binder to mock up the experience of flipping through a magazine. This version is then proofed to confirm final design of the entire issue. Right before printing, we notify FNP of the preferences for our issue, such as number of pages and the number of books needed so they can prepare to print our publication. Before sending the finalized product to print, each staff member looks over the pages, proofing one more time. Once the issue has left the hands of The Equiery office, FNP customer service representative Heidi O’Hara ensures that the printing of the magazine follows The Equiery’s secured publication schedule, decided a whole year ahead of time. All page files are sent to FNP where Heidi’s fellow staff member Eric Fogle, the commercial printing administrator, looks over them to make sure they arrive correctly and if not, ensures that formatting corrections are taken care of. Final online proofs are viewed by our production manager and managing editor Katherine and by advertising sales manager Tracy, where a mutual stamp of approval starts the process from online file to newspaper print. Each page is printed onto large “plates,” sheets of aluminum that contain each page’s image. Each color is plated separately, following the order of black, then blue, magenta, and finally yellow. A camera within the plating section of the web press reads registration marks (an assortment of dots and dashes) for each page, which define what colors are to be applied to each page. Depending on the number of magazines printed for bulk shipping or pick-up for placement in stores, plates are changed to leave room for a shipping label on the front cover. The process of plating is the reason that it is crucial to eliminate mistakes beforehand, because once the plate gets the image pressed onto it, a change is irreversible, and making a new plate is pricey. After the pages are printed, they are moved along the web press to be folded and stitched, finally coming down to the trimmer where the pages are cut on three sides to fit the booklet format that you are reading now. The last step in production involves packaging the finished product and addressing for shipment by a labeling machine that sprays on the individual addresses for the magazine’s dispersal. While FNP is busy putting ink on paper to create The Equiery’s traditional print product, back in Lisbon the staff is busy creating the companion digital products. Katherine converts the digital file into a digital flip book available online (and when you click on a new page, it sounds like flipping paper! ), and Emily and Tracy are fine-tuning the digital records so that they can push into a searchable database on equiery.com on the first of the month. As the social media manager, Jennifer builds the social media support plan for the upcoming issue. Carolyn tidies the books for the issue on press, while the publisher reviews sales, and preps for the next issue. Looking back on the process, one can appreciate how the time, effort, and various individuals’ involvement manage to turn a multitude of ideas into a successful monthly equine multimedia publication! A “preview” of The Equiery is made before the book is flowed. The Equiery online is now fully mobile friendly!